Star Wars X-wing Rebel Pilot leg flare holder.The color is olive drab which many people ask for to match their group as seen in the pictures - the movie and is made of novelty cotton medium weight. There are slots for 8 metal flares which are not included in this item for sale. Sold separately. The flare holder goes on the left leg under the knee on top of the black boot. Part of the X-wing Rebel Costume. Also comes in black for Bounty hunters or Sith. FABRIC: 100% novelty medium weight cotton. The fabric is double sided(lined with the same fabric) on both peices which means finished edges, no fraying of fabric in wash. There is velcro closure on the 2 inch overlap to snap the holder together around the leg. Reproduced by Eva Vanecek dba Eva Vanecek for Cosplay Generation. 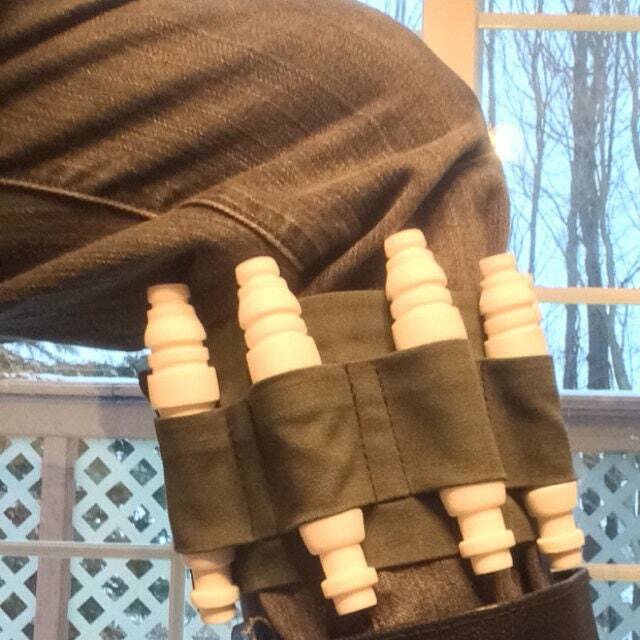 This leg flare holder is designed to hold the metal flares from Elvis trooper. To obtain the flares please contact Elvistrooper.com .